A dermal infection involves the dermis, the dense inner layer of skin beneath the epidermis. These skin infections are caused by microbial invasion, and the presentation and severity of infection vary based on time of treatment, the invading pathogen, and the immune response it elicits. In severe cases, dermal infections can progress to the underlying soft tissue or become systemic. Our dermal studies assess the pharmacodynamic relationship between novel antimicrobial agents and infection outcome. We have established an intradermal infection model in mice in which animals receive a single challenge of an infectious agent via intradermal injection. Test article may be administered via topical application, oral gavage (PO), subcutaneous (SC), intraperitoneal (IP), or intravenous (IV) injection. Each study parameter (animal strain, pathogen, comparator(s), and dosing schedule) can be customized to meet client needs. 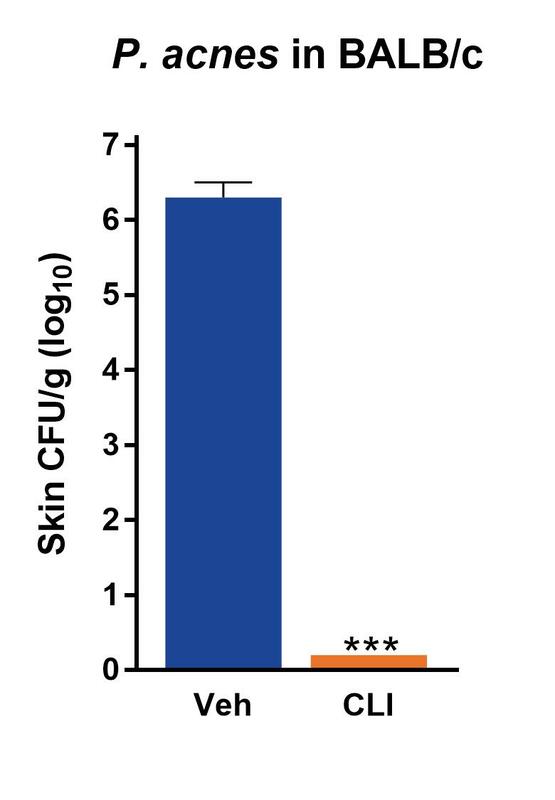 The endpoint for this study is CFU burden in harvested skin. Pharmacokinetic profiling, blood chemistry, additional tissue harvests, and histology are available upon request. Additional validations are available upon request.